For a time in the 1990s, culinary herbs seemed to offer unlimited potential for local growers. There was an ever-increasing demand for fresh and dried herbs by consumers and restaurants. Fresh herbs commanded a higher price per pound than any other edible crop. Herb farming actually looked like a get-rich-quick scheme. But, as with so many trends, the entrance of a few large-scale growers glutted the wholesale market. Internet ordering and next-day delivery services gave chefs access to a huge selection of fresh herbs from distant farms. The herb farming bubble popped. That's not to say that culinary herbs can't be profitable. For many vegetable growers, they are still a top-grossing crop. But generally, the more successful approach to herbs today is to consider them a valuable addition to a vegetable farm, rather than trying to make herbs the only crop. Culinary herbs are a natural add-on that helps sell other veggies and raise the average purchase amount. 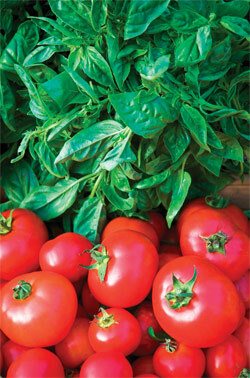 Tomatoes cry out for basil, potatoes for dill, and winter squash for rosemary and thyme. By providing recipes, savvy growers are able to cross-sell many kinds of herbs. Growers who have existing relationships with chefs can explore the possibility of custom growing herbs for specific seasonal menus. Some growers do a good business selling container herbs to restaurants for use in the kitchen or on tables. Supermarkets interesting in developing local food credibility may be open to selling herb bunches in water. Herbs still have great potential for the mixed vegetable grower, but it's smart to study the market and look for niches before planting on a large scale. For a detailed discussion of the current state of culinary herb production in the US, see this report from ATTRA , the National Sustainable Agriculture Assistance Program.